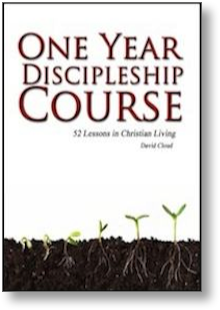 This powerful course features 52 lessons in Christian living. It can be broken up into sections and used as a new converts course, an advanced discipleship course, a Sunday School series, a Home Schooling or Bible Institute course, or preaching outlines. The lessons are thorough and very, very practical. In fact, there is vast deal more depth than other courses we have seen, yet a basic simplicity is retained throughout. There is an extensive memory verse program built into the course. Each lesson is also accompanied by carefully designed review questions. Repentance, Faith (for salvation), The Gospel, Baptism, Eternal Security, Position and Practice, The Law and the New Testament Christian, Christian Growth and Victory, Prayer, Faith (Christian Living), The Armor of God, The Church, The Bible, The Bible's Proof, Daily Bible Study, Key Principles of Bible Interpretation. Foundation Bible Words, Knowing God's Will, Making Wise Decisions, Christ's Great Commission, Suffering in the Christian Life, The Judgment Seat of Christ, Separation, Fasting, Miracles, A Testing Mindset, Tongues Speaking, The Rapture, How to Be Wise with Your Money, The Believer and Drinking, Abortion, Evolution, The Sabbath, and Child Discipline. - eBook available in pdf, mobi, or epub format. Select format in cart system and download from cart at checkout. - Also available in Nepali eBook edition. Book: Softcover, 234 pages, 5.5x8.5 in.